Have you ever taken fish oil supplements and been disappointed by the results? This is more common than you might think. Many women take fish oil hoping the product would improve their skin, hair, or nails. And they just don’t seem to make a difference. But omega-3s really are effective – if you take them the right way. Let me tell you about a good sign that they really do work, what they can do for you, and how to get the results you want both inside and out. A big clue that fish oils and omega-3 supplements are the real deal is that they have at least one drug company scared. So let me tell you the story of Amarin. Amarin is a pharmaceutical company that’s spent a lot of money – over $200 million – to develop a drug to treat hyperlipidemia, or unusually high blood levels of triglycerides. The problem is, the company was hoping the drug would be able to treat a lot more than that. They wanted to be able to market it to cardiovascular patients across the board, not just to those with this specific condition. But they haven’t been able to get approval for these other uses. So the company is stuck trying to recoup its losses by selling the drug for a very high price to a pretty small group of people. Why didn’t they want people to know what the drug was? But Amarin isn’t just worried about trying to convince people to pay for the drug. The company is also worried that people will realize that the drug is refined from fish oil and delivers a gram of eicosapentaenoic acid (EPA) in every dose. Why is Amarin worried that people will realize this? Is EPA dangerous? Nope. It’s just widely available in supplement form already. You don’t need to pay the exorbitant prices for this drug. You can just take a high-quality fish oil supplement instead. To try to protect its investment, Amarin asked the US International Trade Commission (ITC) to block the import of certain fish oil products containing high concentrations of re-esterified forms of fish oil, claiming that these ingredients should be considered unapproved drugs rather than dietary ingredients (even though they come from fish, which is a food not a drug). Fortunately, the FDA, the entity responsible for regulating dietary supplements, recognized the absurdity of this claim and asked the ITC to throw the case out, which it did. Clearly, Amarin believes that fish oil can be effective. It just wants to be able to make a profit off of it. Fish oil and other omega-3 fatty acids are great for you – and not just if you have hyperlipidemia. And you don’t have to wait for drug companies to rearrange them into expensive products they can sell. Let me tell you more about their benefits. By now, you’re probably familiar with telomeres and their implications for health as we age. Telomeres are the caps on the end of your chromosomes. They are like the plastic tip of a shoestring that helps you lace your shoes easier. As you age, telomeres become shorter. The shorter they are, the closer to death you are. Fortunately, there are a number of lifestyle changes you can make to protect your telomeres. One of those changes is to take fish oil. Fish oil helps protect telomeres, particularly in patients with coronary artery disease (CAD). According to a study published in the Journal of the American Medical Association, there is an inverse association between telomere shortening rate and blood levels of fish oil in CAD patients. This means the fish oil may offer protective effects. The study authors concurred with the American Heart Association’s guidelines recommending that CAD patients take 1 g of omega-3 fatty acids a day, whether from supplements or eating fatty fish. Of course, you shouldn’t wait until you have CAD to let omega-3s go to work protecting your telomeres. Having healthy telomeres is one of the best protective measures against signs and problems of aging we have. And omega-3s will also help reduce inflammation throughout your body, which you know is vital for good health. And yes, these fatty acids can even help restore luster to your skin, hair, and nails. So why are so many people who take these supplements not seeing any results, at least externally? While it’s true that taking a gram of fish oil a day will help your heart and your telomeres, unfortunately that’s not enough to make an external difference. 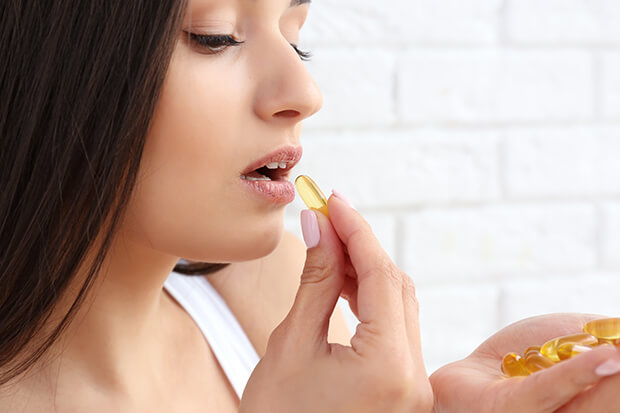 For this, you need a much higher dose – up to 3,600 mg.
That’s a lot of pills, especially if you weren’t wild about the idea of taking a fish oil-based product in the first place. (Some vegetarians or vegans balk at this, and other people just don’t like swallowing pills, especially since some have a fishy aftertaste.) Fortunately, there’s a solution: Udo’s Oil 3.6.9. This liquid product is made from organic flax, sesame, and sunflower seed oils to give you all the omega-3 fatty acids you need in a convenient form. I first heard of Udo’s 3.6.9 many years ago from a patient, Katherine. Katherine’s vet told her to give Udo’s to her dog, Alice, to restore her dry coat. After two months, Katherine was amazed by how healthy Alice’s coat looked and decided to try the product herself. Here was her reaction: “Wow! It worked for Alice, and it worked for me. Look at my hair and nails – so different, softer, and healthier looking.” Because omega-3s and omega-6s are the actual building blocks of our cell membranes, these essential fatty acids help to create the skin’s natural oil barrier. That’s why they contribute so much to skin hydration and to skin that looks younger overall. To get results like Katherine’s, you just have to stick with the high doses for a while. In fact, I recommend that you take at least a tablespoon twice a day for a minimum of 60 days. I bet you’ll be able to see a difference. I know that sounds like a lot. But because the product is liquid, you can sneak it into a lot of different foods. Some people put it on salads or oatmeal, while others slip it into smoothies. Of course, you can always just swallow it right down if you don’t mind the taste. And even if you don’t think it tastes great, I think you’ll find the results of moisturized skin and stronger hair and nails to be worth it. Once you do see changes, you can reduce your intake to one tablespoon a day. If this much oil upsets your digestion, try making it into a salad dressing by combining it with apple cider vinegar. Of course, if you’re already taking a fish oil or other omega-3 supplement that you’re happy with, you can and should keep that up. Even at lower doses, omega-3 fatty acids are great for your telomeres and cardiovascular system. But if you want to kick your results up a notch, try increasing your dose until you hit the 3,600 mg a day mark for two months. You can even do this by combining the pills and the liquid until you find a mix that works for you. Whether you’re perimenopausal, menopausal, postmenopausal, or recovering from pregnancy, I know you’ll appreciate these results. The hormones associated with female transitions can often have significant effects on the skin, hair, and nails, making them appear dry and lackluster. Fatty acids can help restore your glow if you give them a chance to work. And here’s one final tip: To really supercharge your fish oil’s effect on your skin, take some vitamin E with it. Vitamin E is a powerful antioxidant. As you may know, UV exposure can generate free radicals in the skin. When this happens, vitamin E can help stop these free radicals from aging your hair and skin. It does this by keeping cell membranes stable. It also stops polyunsaturated fatty acids from oxidizing. Oxidation translates to damage. So it’s great to take along with your fish oil. Several studies have found that applying vitamin E topically helps sunburns heal. And it can help reduce sun damage and even skin cancer risk. Taking vitamin E orally is where you’ll get the most benefit. One three-week study found that taking a daily vitamin E supplement could significantly increase vitamin E levels in the skin. If you’d rather not take a supplement, you can get vitamin E in your diet from foods like almonds and leafy greens. Try topping a spinach salad with orange segments and slivered almonds for a glow-boosting meal.